Industrials are coming off their worst annual performance since the financial crisis, falling 15 percent in 2018. Concerns over U.S.-China trade negotiations as well as fear of an economic slowdown kept the group under pressure last year. Some of these worries are receding, however, bolstering the sector in 2019. "We're living in a world where growth is declining. S&P 500 earnings are de-accelerating, so if you can get stocks that have above-average growth to the S&P, then that's really attractive," says one money manager. "Industrials are at least showing above-average growth," said John Davi, chief investment officer at Astoria Portfolio Advisors. "We're living in a world where growth is declining. S&P 500 earnings are de-accelerating, so if you can get stocks that have above-average growth to the S&P, then that's really attractive." The industrial sector is among the three-best performing in the S&P 500 this year, rising 15.7 percent to date. The gains have largely been led by General Electric, which is up more than 40 percent this year after a dreadful 2018. Other companies driving the gains in the industrials sector are Masco and TransDigm Group, which are up at least 30 percent this year and are among the 10 best-performing stocks in the space. Masco's 33 percent surge is driven by strong quarterly results and investors cheering the company for pursuing strategic alternatives for its cabinet and window business. TransDigm — which makes commercial and military aerospace components — is also being lifted by better-than-expected earnings as well as the acquisition of Esterline Technologies, which closed earlier this month. 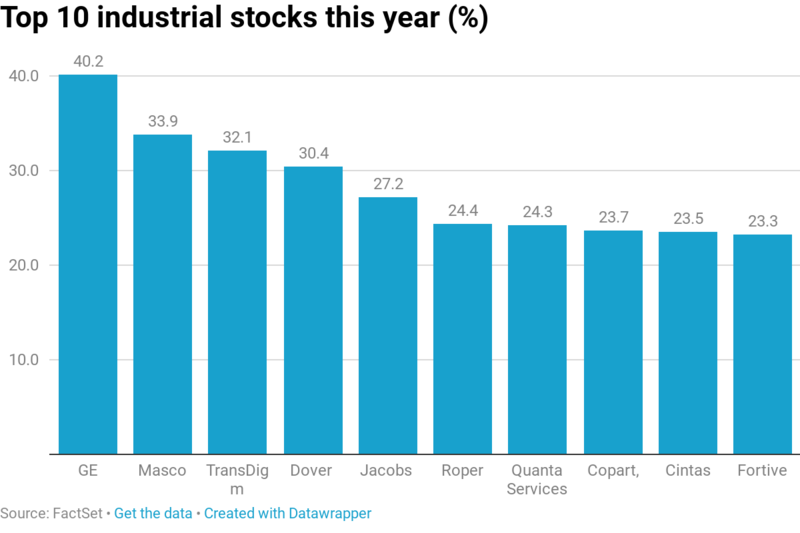 Other companies rounding out the top 10 industrial stocks this year are Dover Corp., Jacobs Engineering, Roper Technologies, Quanta Services, Copart, Cintas and Fortive. "You want to own higher-quality stocks with above-average growth estimates," said Davi. "The call from us hasn't been to necessarily plow money into the defensive sectors like utilities and staples, but to have companies with strong balance sheets and above-average growth." However, the sector's gains and earnings growth could be capped if Boeing continues to struggle. Boeing shares are down more than 7 percent since last week, when a 737 Max 8 plane crashed. The crash was the second in less than six months involving the 737 Max. Several countries, including the United States, grounded all flights that use the aircraft. "Boeing (BA) represents 10% of the sector, and the overhang from several countries grounding the 737 Max could weigh on the sector near term," Savita Subramanian, equity and quantitative strategist at Bank of America Merrill Lynch, wrote in a note Friday, adding that Boeing's troubles are keeping the sector "grounded." Subramanian added, however, that "other high-quality industries within the Industrials sector could benefit from Boeing outflows translating into inflows." She also said the industrial sector is the bank's top ranked on a tactical basis, citing "strong performance and earnings revisions." Another risk facing industrials is the possibility of a global economic slowdown. While some of those concerns have dissipated, economic data remain mixed at best. Industrial production is among the weak data. It rose just 0.1 percent last month, well below expectations. The disappointing number was largely attributed to a decline in manufacturing activity. There were some bright spots in the data, however. Overall industrial production is up 3.5 percent over the past 12 months as mining and defense activity increased more than 11 percent each. The Citi Economic Surprise Index, a barometer of how economic data fare relative to expectations, reached its lowest level since August 2017 earlier this month and remains well in negative territory. That indicates the data are largely underperforming economist expectations, a sign that the Street's optimism may have to be reined in. "We remain skeptical about the ability of industrial stocks to sustainably outperform amid the ongoing sluggish global growth environment and recent weaker readings in leading indicators of U.S. factory activity," Salvatore Ruscitti, U.S. equity strategist at MRB Partners, said in a note. "Against this backdrop, we believe earnings expectations for the sector are too optimistic relative to other cyclical groups. Downgrades to relative earnings are likely in the coming months, which will weigh on relative performance. Accordingly, we recommend maintaining an underweight stance." Still, industrials could get a boost if China and the U.S. reach a trade deal. The world largest economies have been engaged in a trade war for the better part of a year, raising concern over global growth and thus pressuring industrials. However, the two countries are expected to strike a trade deal sometime between late March and April, potentially removing a headwind for the group.